I know Halloween is just around the corner but you can sew up this costume in just a couple hours – there’s plenty of time! I’ve put together the cutest little retro fifties poodle skirt-style outfit – but with an awesome new twist! 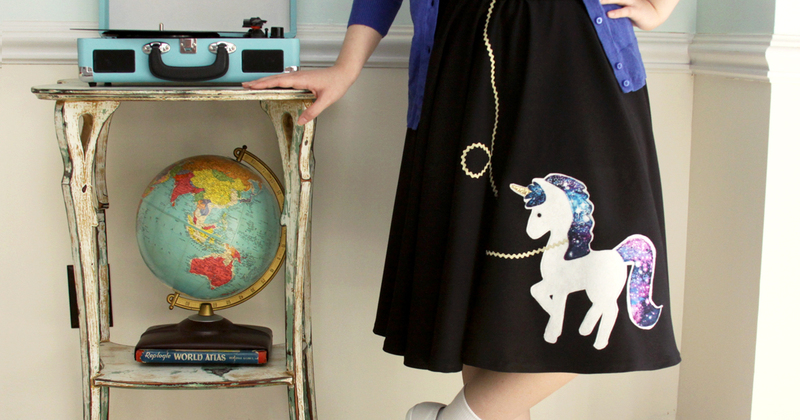 This cute Fifties Unicorn skirt and matching little galaxy saddle shoes will take your whole costume to a new level! My favorite thing about it – other than the adorable unicorn – is that you could use this outfit for more than just Halloween! 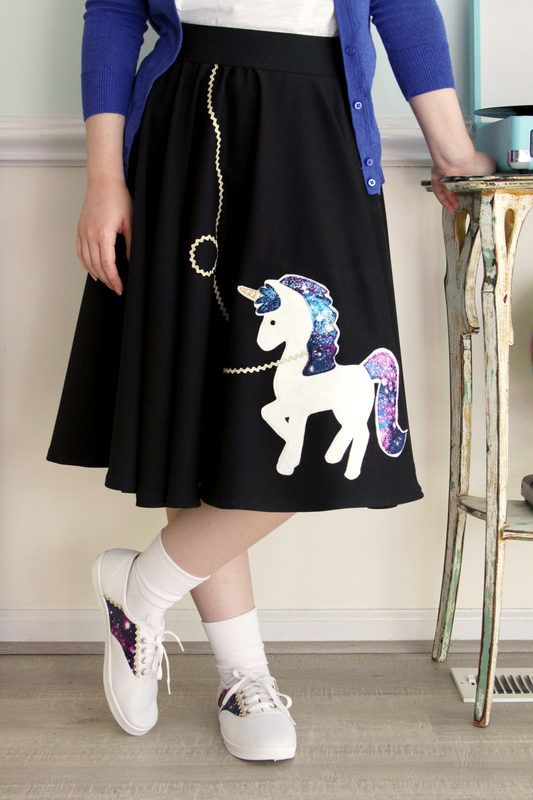 It would be perfect for a fifties party or a unicorn theme party – or even a cute cosplay outfit! The skirt is super easy to sew – it’s great for beginners or more advanced seamstresses. 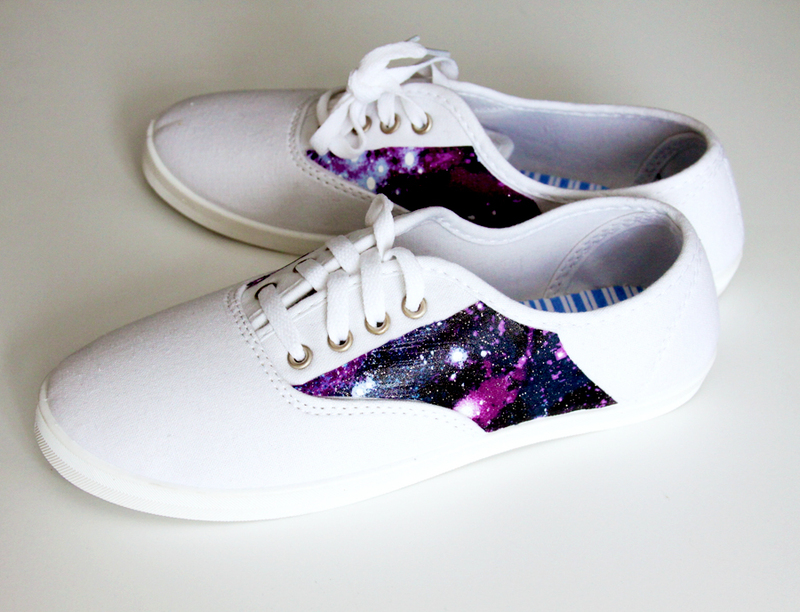 And I’ve included a simple diy for these matching Galaxy Saddle shoes to finish off your outfit! For the skirt portin of the outfit, I made a basic circle skirt using Dana from Made Everyday’s fabulous tutorial. She has instructions for skirts for both women and children. I followed the instructions and the skirt fits my daughter perfectly! 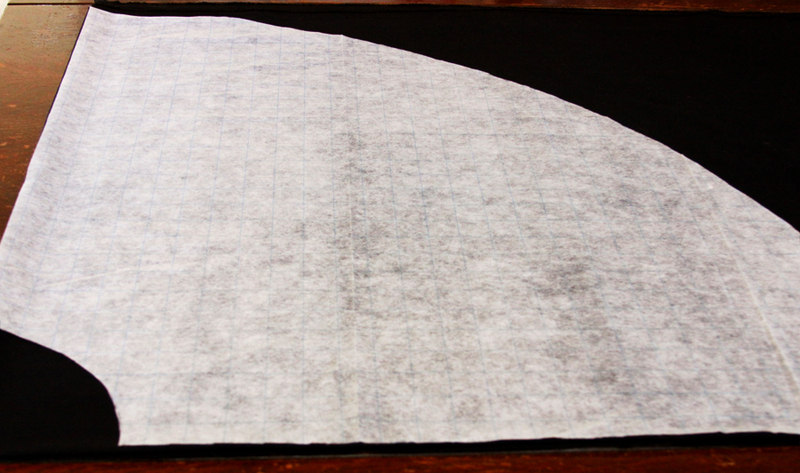 To make this skirt – follow Dana’s instructions to make your own pattern and cut out the skirt. Finish the top and bottom of the skirt with a zig zag stitch. 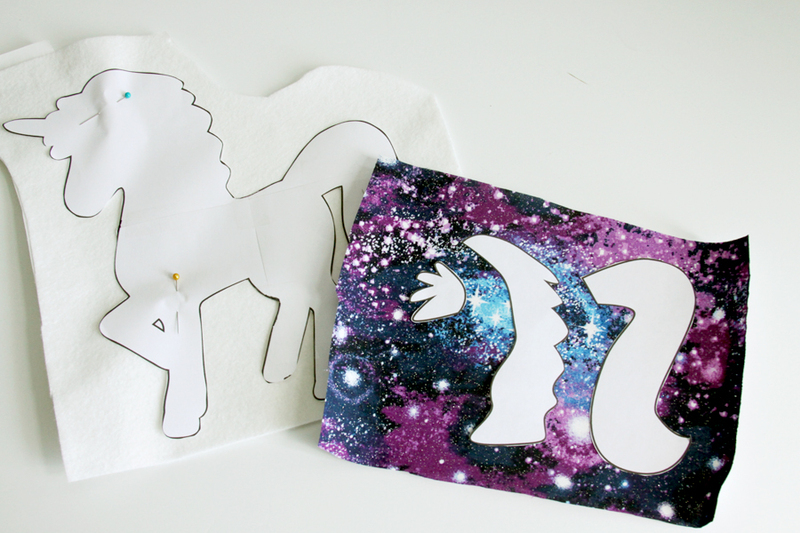 Print out and tape together the unicorn pattern, then cut the pattern out. Cut pieces of wool felt, the fabric for the mane and tail, and the gold for the horn that are a little bigger than the pattern pieces. Iron fusible webbing to the back side of all of the fabrics. Cut out all the pieces. 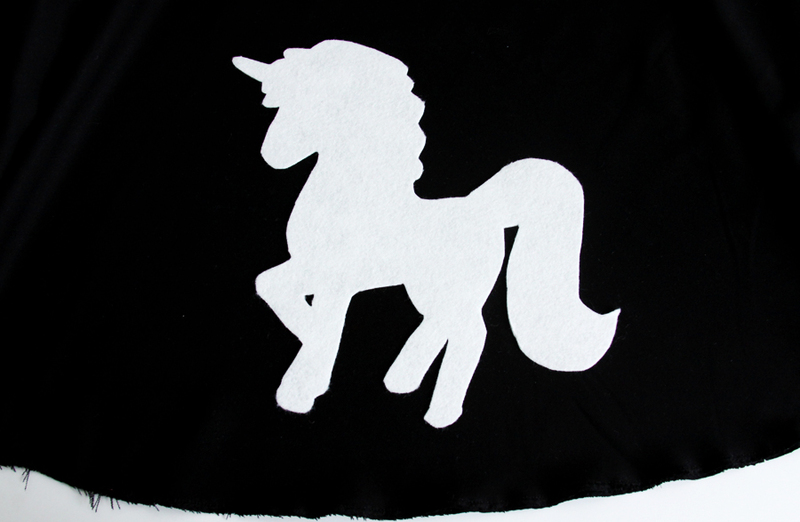 Iron the white felt unicorn piece to the skirt. You want it on the right side of the skirt, a few inches above the hem. 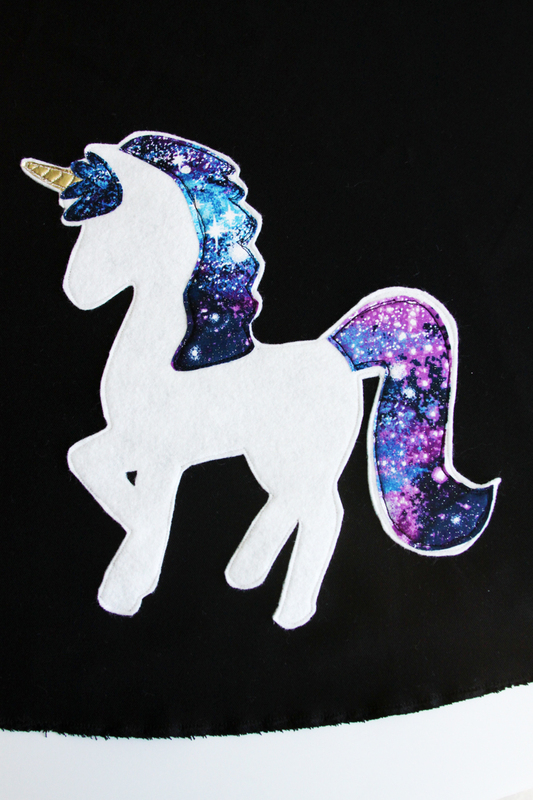 Sew around the unicorn with white thread, just inside the edge of the felt. Iron the horn in place and stitch it down as well. Add some little diagonal rows for the spirals in the horn. Iron the mane and tail in place and sew around them. 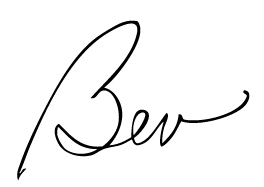 I used a couple of rows of stitching for these, to give it more of a “hand-drawn” look. You could use a small zig zag stitch as well. Layout and pin the gold rick rack “leash”. Have it cross the neck of the unicorn and cross over to the left side of the skirt, make a loop, and end up at the top of the skirt, a few inches to the left of the center front. Sew the rick rack down. 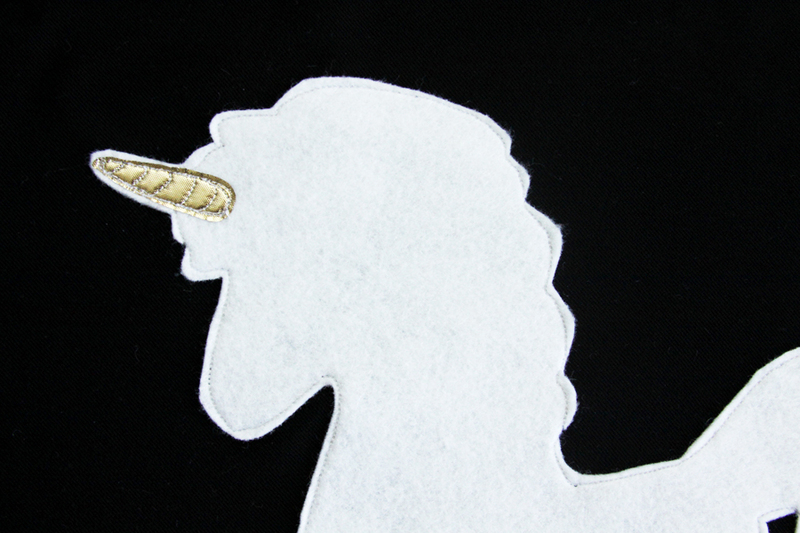 Sew on the small button for the eye of the unicorn. Finish the skirt according to Dana’s tutorial by sewing on the waistband and hemming the skirt. 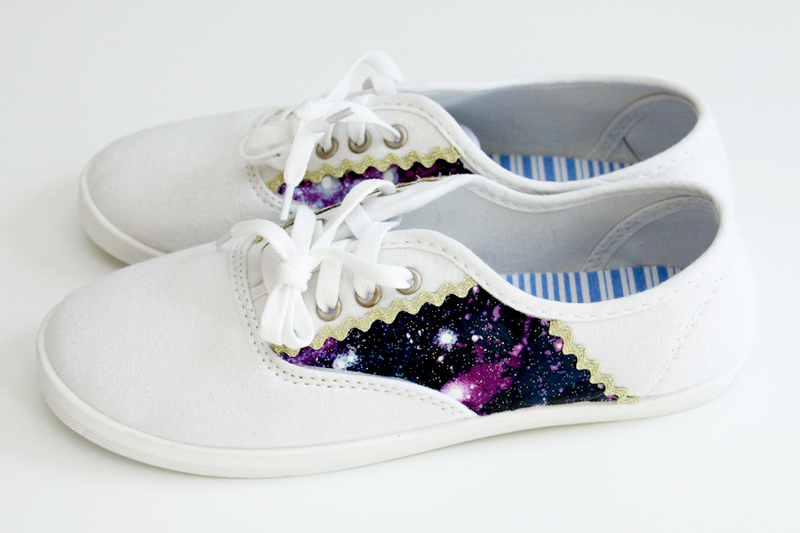 To make the matching shoes – cut small pieces of galaxy fabric that follow the seams on the shows and curve around to halfway back on the sides. Using Mod Podge for fabric, apply the fabric to the sides of the shoe. Glue pieces of rick rack along the top straight edge and the side curved edge. So cute right? 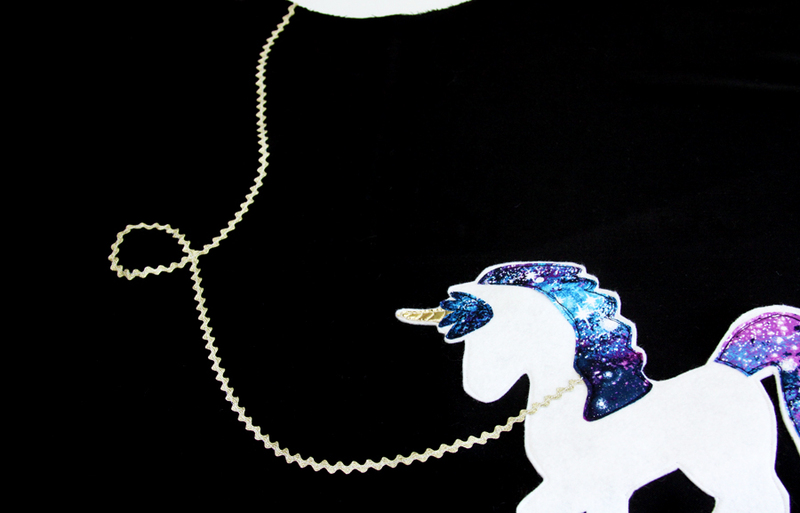 Now you can show off your fifties inspired unicorn outfit! Do you still have Halloween sewing to do? I’d love to know what you’re making up! I love the Galaxy fabric!!! This is great! Love the fabric and the cute matching shoes! Thank you for sharing on Merry Monday! Hope to see ya next week! So super cute, especially paired with those shoes! Thanks for sharing at Merry Monday! 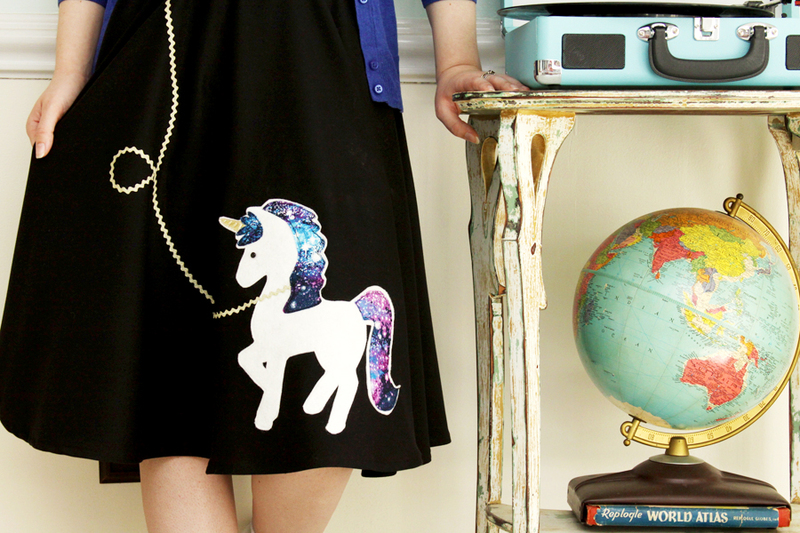 I’ll be including your unicorn skirt in my Party Features next week. I saw this picture on the #FriendshipFriday link and had to leave a comment because it made me smile. What a great take on the traditional poodle skirt! This Halloween costume is everything! 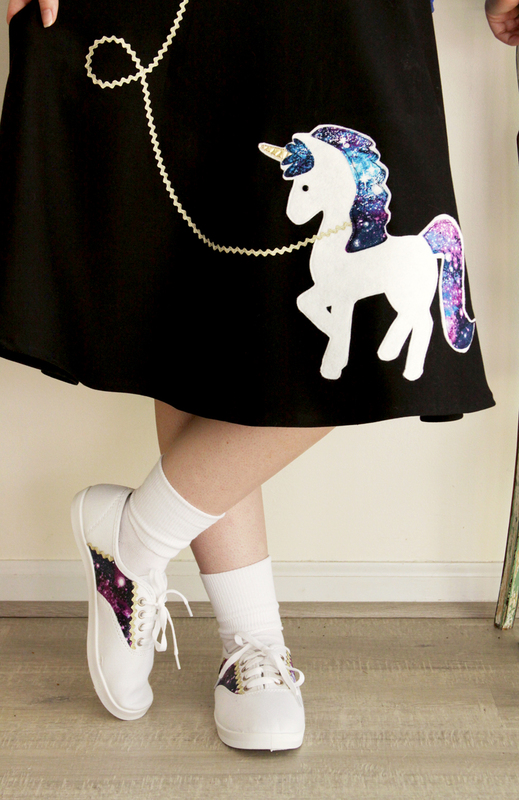 I love the unicorn and the shoes are the finishing touch. Thanks for sharing on Sunday’s Best. So cute! I love unicorns!! Thanks for sharing with SYC.